Our first shipment of Charles Owen helmets arrived! They are beautiful helmets. If you would like to order a CO helmet, order forms are available at the EC office in anticipation to get a new shipment this term. go to http://www.nbnnews.com.au/2017/01/11/jamie-jumping-onwards-and-upwards/ to watch Jaimie in all her glory. 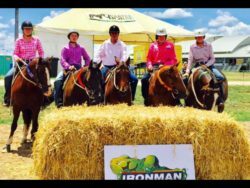 Laura Hardie was back in action in January at Tamworth Ironman 4×4 National Campdraft at ALEC. She won round 2 with a score of 92 on “Lenas Conman”. She also took out the 2016 Runner Up Juvenile Title. Well done, Laura. Keep up the good work.